"Soy" redirects here. For other uses, see Soy (disambiguation). The soybean (Glycine max), or soya bean, is a species of legume native to East Asia, widely grown for its edible bean, which has numerous uses. Fat-free (defatted) soybean meal is a significant and cheap source of protein for animal feeds and many packaged meals. For example, soybean products, such as textured vegetable protein (TVP), are ingredients in many meat and dairy substitutes. The beans contain significant amounts of phytic acid, dietary minerals and B vitamins. Soy vegetable oil, used in food and industrial applications, is another product of processing the soybean crop. Traditional unfermented food uses of soybeans include soy milk, from which tofu and tofu skin are made. 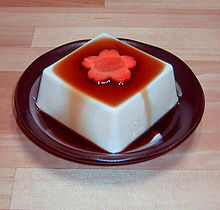 Fermented soy foods include soy sauce, fermented bean paste, natto, and tempeh. Soybean is the most important protein source for feed farm animals (that in turn yields animal protein for human consumption). "Soy" originated as a corruption of the Chinese or Japanese names for soy sauce (Chinese: 豉油; pinyin: chǐyóu; Jyutping: si6jau4; Cantonese Yale: sihyàuh) (Japanese: 醤油, shōyu). The etymology of the genus, Glycine, comes from Linnaeus. When naming the genus, Linnaeus observed that one of the species within the species had a sweet root. Based on the sweetness, the Greek word for sweet, glykós, was Latinized. The genus name is not related to the amino acid glycine. The genus Glycine Willd. is divided into two subgenera, Glycine and Soja. The subgenus Soja (Moench) F.J. Herm. includes the cultivated soybean, Glycine max (L.) Merr., and the wild soybean, Glycine soja Sieb. & Zucc. Both species are annuals. Glycine soja is the wild ancestor of Glycine max, and grows wild in China, Japan, Korea and Russia. The subgenus Glycine consists of at least 25 wild perennial species: for example, Glycine canescens F.J. Herm. and G. tomentella Hayata, both found in Australia and Papua New Guinea. Perennial soybean (Neonotonia wightii) originated in Africa and is now a widespread pasture crop in the tropics. Like some other crops of long domestication, the relationship of the modern soybean to wild-growing species can no longer be traced with any degree of certainty. It is a cultural variety with a very large number of cultivars. Like most plants, soybeans grow in distinct morphological stages as they develop from seeds into fully mature plants. The first stage of growth is germination, a method which first becomes apparent as a seed's radicle emerges. This is the first stage of root growth and occurs within the first 48 hours under ideal growing conditions. The first photosynthetic structures, the cotyledons, develop from the hypocotyl, the first plant structure to emerge from the soil. These cotyledons both act as leaves and as a source of nutrients for the immature plant, providing the seedling nutrition for its first 7 to 10 days. The first true leaves develop as a pair of single blades. Subsequent to this first pair, mature nodes form compound leaves with three blades. Mature trifoliolate leaves, having three to four leaflets per leaf, are often between 6–15 cm (2.4–5.9 in) long and 2–7 cm (0.79–2.76 in) broad. Under ideal conditions, stem growth continues, producing new nodes every four days. Before flowering, roots can grow 1.9 cm (0.75 in) per day. If rhizobia are present, root nodulation begins by the time the third node appears. Nodulation typically continues for 8 weeks before the symbiotic infection process stabilizes. The final characteristics of a soybean plant are variable, with factors such as genetics, soil quality, and climate affecting its form; however, fully mature soybean plants are generally between 51–127 cm (20–50 in) in height and have rooting depths between 76–152 cm (30–60 in). Flowering is triggered by day length, often beginning once days become shorter than 12.8 hours. This trait is highly variable however, with different varieties reacting differently to changing day length. Soybeans form inconspicuous, self-fertile flowers which are borne in the axil of the leaf and are white, pink or purple. Depending of the soybean variety, node growth may cease once flowering begins. Strains that continue nodal development after flowering are termed "indeterminates" and are best suited to climates with longer growing seasons. Often soybeans drop their leaves before the seeds are fully mature. The fruit is a hairy pod that grows in clusters of three to five, each pod is 3–8 cm (1.2–3.1 in) long and usually contains two to four (rarely more) seeds 5–11 mm in diameter. Soybean seeds come in a wide variety sizes and hull colors such as black, brown, yellow, and green. Variegated and bicolored seed coats are also common. The hull of the mature bean is hard, water-resistant, and protects the cotyledon and hypocotyl (or "germ") from damage. If the seed coat is cracked, the seed will not germinate. The scar, visible on the seed coat, is called the hilum (colors include black, brown, buff, gray and yellow) and at one end of the hilum is the micropyle, or small opening in the seed coat which can allow the absorption of water for sprouting. Some seeds such as soybeans containing very high levels of protein can undergo desiccation, yet survive and revive after water absorption. A. Carl Leopold began studying this capability at the Boyce Thompson Institute for Plant Research at Cornell University in the mid-1980s. He found soybeans and corn to have a range of soluble carbohydrates protecting the seed's cell viability. Patents were awarded to him in the early 1990s on techniques for protecting biological membranes and proteins in the dry state. Like many legumes, soybeans can fix atmospheric nitrogen, thanks to symbiotic bacteria from the Rhizobia group. Together, protein and soybean oil content account for 56% of dry soybeans by weight (36% protein and 20% fat, table). The remainder consists of 30% carbohydrates, 9% water and 5% ash (table). Soybeans comprise approximately 8% seed coat or hull, 90% cotyledons and 2% hypocotyl axis or germ. 100 grams of raw soybeans supply 446 calories and are 9% water, 30% carbohydrates, 20% total fat and 36% protein (table). Soybeans are an exceptional source of essential nutrients, providing in a 100 gram serving (raw, for reference) high contents of the Daily Value (DV) especially for protein (36% DV), dietary fiber (37%), iron (121%), manganese (120%), phosphorus (101%) and several B vitamins, including folate (94%) (table). High contents also exist for vitamin K, magnesium, zinc and potassium (table). For human consumption, soybeans must be cooked with "wet" heat to destroy the trypsin inhibitors (serine protease inhibitors). Raw soybeans, including the immature green form, are toxic to all monogastric animals. Most soy protein is a relatively heat-stable storage protein. This heat stability enables soy food products requiring high temperature cooking, such as tofu, soy milk and textured vegetable protein (soy flour) to be made. Soy protein products can be good substitutes for animal products because, unlike some other beans, soy offers a 'complete' protein profile. ... Soy protein products can replace animal-based foods—which also have complete proteins but tend to contain more fat, especially saturated fat—without requiring major adjustments elsewhere in the diet. The Protein Digestibility Corrected Amino Acid Score (PDCAAS) of soy protein is the nutritional equivalent of meat, eggs, and casein for human growth and health. Soybean protein isolate has a biological value of 74, whole soybeans 96, soybean milk 91, and eggs 97. Soy protein is essentially identical to the protein of other legume seeds and pulses. Moreover, soybeans can produce at least twice as much protein per acre than any other major vegetable or grain crop besides hemp, five to 10 times more protein per acre than land set aside for grazing animals to make milk, and up to 15 times more protein per acre than land set aside for meat production. All spermatophytes, except for the grass-cereal family, contain soybean-like 7S (vicilin) or 11S (legumin), (S denotes Svedberg, sedimentation coefficients) seed storage globulin proteins. Oats and rice are anomalous in that they also contain a majority of soybean-like protein. Cocoa, for example, contains the 7S globulin, which contributes to cocoa/chocolate taste and aroma;, whereas coffee beans (coffee grounds) contain the 11S globulin responsible for coffee's aroma and flavor. Vicilin and legumin proteins belong to the cupin superfamily, a large family of functionally diverse proteins that have a common origin and whose evolution can be followed from bacteria to eukaryotes including animals and higher plants. 2S albumins form a major group of homologous storage proteins in many dicot species and in some monocots but not in grasses (cereals). Soybeans contain a small but significant 2S storage protein. 2S albumin are grouped in the prolamin superfamily. Other allergenic proteins included in this 'superfamily' are the non-specific plant lipid transfer proteins, alpha amylase inhibitor, trypsin inhibitors, and prolamin storage proteins of cereals and grasses. Peanuts, for instance, contain 20% 2S albumin but only 6% 7S globulin and 74% 11S. It is the high 2S albumin and low 7S globulin that is responsible for the relatively low lysine content of peanut protein compared to soy protein. The principal soluble carbohydrates of mature soybeans are the disaccharide sucrose (range 2.5–8.2%), the trisaccharide raffinose (0.1–1.0%) composed of one sucrose molecule connected to one molecule of galactose, and the tetrasaccharide stachyose (1.4 to 4.1%) composed of one sucrose connected to two molecules of galactose. While the oligosaccharides raffinose and stachyose protect the viability of the soybean seed from desiccation (see above section on physical characteristics) they are not digestible sugars, so contribute to flatulence and abdominal discomfort in humans and other monogastric animals, comparable to the disaccharide trehalose. Undigested oligosaccharides are broken down in the intestine by native microbes, producing gases such as carbon dioxide, hydrogen, and methane. Since soluble soy carbohydrates are found in the whey and are broken down during fermentation, soy concentrate, soy protein isolates, tofu, soy sauce, and sprouted soybeans are without flatus activity. On the other hand, there may be some beneficial effects to ingesting oligosaccharides such as raffinose and stachyose, namely, encouraging indigenous bifidobacteria in the colon against putrefactive bacteria. The insoluble carbohydrates in soybeans consist of the complex polysaccharides cellulose, hemicellulose, and pectin. The majority of soybean carbohydrates can be classed as belonging to dietary fiber. Raw soybeans are 20% fat, including saturated fat (3%), monounsaturated fat (4%) and polyunsaturated fat, mainly as linoleic acid (table). Within soybean oil or the lipid portion of the seed is contained four phytosterols: stigmasterol, sitosterol, campesterol, and brassicasterol accounting for about 2.5% of the lipid fraction; and which can be converted into steroid hormones. Additionally soybeans are a rich source of sphingolipids. The following table shows the nutrient content of green soybean and other major staple foods, each in respective raw form. Raw soybeans, however, aren't edible and cannot be digested. These must be sprouted, or prepared and cooked for human consumption. In sprouted and cooked form, the relative nutritional and anti-nutritional contents of each of these grains is remarkably different from that of raw form of these grains reported in this table. The nutritional value of soybean and each cooked staple depends on the processing and the method of cooking: boiling, frying, roasting, baking, etc. Soybeans are a globally important crop, providing oil and protein. In the United States, the bulk of the harvest is solvent-extracted with hexane, and the "toasted" defatted soymeal (50% protein) then makes possible the raising of farm animals (e.g. chicken, hog, turkey) on a large industrial scale. Soybean products are used in a large variety of processed foods. During World War II, soybeans became important in both North America and Europe chiefly as substitutes for other protein foods and as a source of edible oil. During the war, the soybean was discovered as fertilizer by the United States Department of Agriculture. Cultivation is successful in climates with hot summers, with optimum growing conditions in mean temperatures of 20 to 30 °C (68 to 86 °F); temperatures of below 20 °C and over 40 °C (68 °F, 104 °F) stunt growth significantly. They can grow in a wide range of soils, with optimum growth in moist alluvial soils with a good organic content. Soybeans, like most legumes, perform nitrogen fixation by establishing a symbiotic relationship with the bacterium Bradyrhizobium japonicum (syn. Rhizobium japonicum; Jordan 1982). For best results, though, an inoculum of the correct strain of bacteria should be mixed with the soybean (or any legume) seed before planting. Modern crop cultivars generally reach a height of around 1 m (3.3 ft), and take 80–120 days from sowing to harvesting. Environmental groups such as Greenpeace and the WWF have reported soybean cultivation—especially soybean cultivation in Brazil—has already destroyed huge areas of Amazon rainforest, and is encouraging further deforestation. The driving cause of this deforestation is the global demand for meat, which in turn requires huge tracts of land to grow feed crops for livestock. According to the World Bank, animal agriculture is responsible for up to 91% of the destruction of the Amazon rainforest. Soil scientists Edson Lobato (Brazil), Andrew McClung (U.S.), and Alysson Paolinelli (Brazil) were awarded the 2006 World Food Prize for transforming the ecologically biodiverse savannah of the Cerrado region of Brazil into highly productive cropland that could grow profitable soybeans. However, even correcting for poor soils soybeans were an unlikely cash crop for the Cerrado. Soy did not fare well in the low latitudes. More than the heat and humidity, it was a lack of seasons that hampered production. In the higher more northerly latitudes, flowering coincides with the summer solstice, when the plants reach their maximum height. The first soybeans planted in the Cerrado, however, flowered early and, deprived of long summer days, remained stunted. For soy agriculture to take root in Mato Grosso it was first necessary to develop a "tropical soybean"—one that would flower later, giving the plants more time to fully mature. This was accomplished after years of crossbreeding by scientists within Embrapa, the research arm of the Brazilian Ministry of Agriculture. Human sewage sludge can be used as fertilizer to grow soybeans. Soybeans grown in sewage sludge likely contain elevated concentrations of metals. Soybean plants are vulnerable to a wide range of bacterial diseases, fungal diseases, viral diseases and parasites. One important pest is the corn earworm moth and bollworm, which is the most common and destructive pest of soybean growth in Virginia. Country code; ISO 3166-1 alpha-3, oth 86; other 86 countries. Top 8 countries produced 94.82% in 2016. The main countries growing soybeans in 2016 were the United States (35% of world total), Brazil (29%) and Argentina (18%). The global production of soybeans is forecast to be 337 million tonnes in 2017–2018, The United States, Brazil and Argentina are the world's largest soybean producers and represent more than 80% of global soybean production (table). In 2016, the average worldwide yield for soybean crops was 2.8 tonnes per hectare. The three largest yields per hectare were in Turkey, Georgia and Italy, having an average nationwide soybean yield of 4.0 tonnes. The most productive soybean farms in the world in 2016 were in Turkey, with a nationwide average farm yield of 4.3 tonnes per hectare. In the 1960–01 Dillon round of the General Agreement on Tariffs and Trade (GATT), the United States secured tariff-free access for its soybeans to the European market. In the 1960s, the United States exported over 90% of the world's soybeans. By 2005, the top soybean exporters were Argentina (39% of world soybean exports), United States (37%), and Brazil (16%), while the top importers were China (41% of world soybean imports), European Union (22%), Japan (6%) and Mexico (6%). Soybeans were a crucial crop in East Asia long before written records began. There is evidence for soybean domestication between 7000 and 6600 BC in China, between 5000 and 3000 BC in Japan and 1000 BC in Korea. Prior to fermented products such as fermented black soybeans (douchi), jiang (Chinese miso), soy sauce, tempeh, natto, and miso, soy was considered sacred for its beneficial effects in crop rotation, and it was eaten by itself, and as bean curd and soy milk. Soybeans were introduced to Java in Malay Archipelago circa 13th century or probably earlier. By the 17th century through their trade with Far East, soybeans and its products were traded by European traders (Portuguese, Spanish, and Dutch) in Asia, and supposedly reached Indian Subcontinent by this period. By the 18th century, soybeans were introduced to the Americas and Europe from China. Soy was introduced to Africa from China in the late 19th century, and is now widespread across the continent. They are now a major crop in the United States, Brazil, Argentina, India, and China. The closest living relative of the soybean is Glycine soja (previously called G. ussuriensis), a legume native to central China. According to the ancient Chinese myth, in 2853 BC, the legendary Emperor Shennong of China proclaimed that five plants were sacred: soybeans, rice, wheat, barley, and millet. Cultivation of soybeans took place over long periods of time in the prehistory of modern-day Japan, Korea and Northern China, based on archaeological evidence. The origin of soy bean cultivation remains scientifically debated. Early Chinese records mention that soybeans were a gift from the region of Yangtze River delta and Southeast China. Recent research, however, indicates that seeding of wild forms started early (before 5000 BC) in multiple locations throughout East Asia The Great Soviet Encyclopedia claims soybean cultivation originated in China about 5000 years ago. Some scholars suggest that soybean originated in China and was domesticated about 3500 BC. The earliest documented evidence for the use of Glycine of any kind comes from charred plant remains of wild soybean recovered from Jiahu in Henan province China, a Neolithic site occupied between 9000 and 7800 calendar years ago (cal bp) Centered around this region, an abundance of archeological, charred soybean specimens. However, the oldest preserved soybeans resembling modern varieties in size and shape were found in archaeological sites in Korea dated about 1000 BC. Radiocarbon dating of soybean samples recovered through flotation during excavations at the Early Mumun period Okbang site in Korea indicated soybean was cultivated as a food crop in around 1000–900 BC. Soybeans from the Jōmon period in Japan from 3000 BC are also significantly larger than wild varieties. The cultivation of soybeans began in the eastern half of northern China by 2000 BC, but is almost certainly much older. Soybeans became an important crop by the Zhou Dynasty (c. 1046–256 BC) in China. However, the details of where, when, and under what circumstances soybean developed a close relationship with people are poorly understood. Soy bean was unknown in South China before the Han period. From about the first century AD to the Age of Discovery (15–16th centuries), soybeans were introduced into across South and Southeast Asia. This spread was due to the establishment of sea and land trade routes. The earliest Japanese textual reference to the soybean is in the classic Kojiki (Records of Ancient Matters), which was completed in AD 712. Many people have claimed soybeans in Asia were historically only used after a fermentation process, which lowers the high phytoestrogens content found in the raw plant. However, terms similar to "soy milk" have been in use since AD 82, and there is evidence of tofu consumption that dates to 220. Soybeans were mentioned as kadêlê (modern Indonesian term: kedelai) in an old Javanese manuscript, Serat Sri Tanjung, which dates around the 12th to 13th century Java. By the 13th century, the soybean had arrived and cultivated in Indonesia; it probably arrived much earlier however, carried by traders or merchants from Southern China. The earliest known reference to it as "tempeh" appeared in 1815 in the Serat Centhini manuscript. The development of tempeh fermented soybean cake were probably took place earlier, circa 17th century in Java. By the 1600s, soy sauce spread from southern Japan across the region through the Dutch East India Company (VOC). The soybean probably arrived from southern China, moving southwest into northern parts of Indian subcontinent by this period. In 1603, "Vocabvlario da Lingoa de Iapam", a famous Japanese-Portuguese dictionary, was compiled and published by Jesuit priests in Nagasaki. It contains short but clear definitions for about 20 words related to soyfoods – the first in any European language. The Luso-Hispanic traders were familiar with soybeans and soybean product through their trade with Far East since at least 17th century. However, it was not until the late 19th century that the first attempt to cultivate soybeans in the Iberian peninsula was undertaken. In 1880, the soybean was first cultivated in Portugal in the Botanical Gardens at Coimbra (Crespi 1935). In about 1910 in Spain the first attempts at Soybean cultivation were made by the Count of San Bernardo, who cultivated soybeans on his estates at Almillo (in southwest Spain) about 48 miles east-northeast of Seville. Soybeans were first introduced to North America from China in 1765, by Samuel Bowen, a former East India Company sailor who had visited China in conjunction with James Flint, the first Englishman legally permitted by the Chinese authorities to learn Chinese. The first "New World" soybean crop was grown on Skidaway Island, Georgia in 1765 by Henry Yonge from seeds given him by Samuel Bowen. Bowen grew soy near Savannah, Georgia, possibly using funds from Flint, and made soy sauce for sale to England. Although, soybean was introduced into North America in 1765, for the next 155 years, the crop was grown primarily for forage. In 1831, the first soy product "a few dozen India Soy" [sauce] arrived in Canada. Soybeans were probably first cultivated in Canada by 1855, and definitely in 1895 at Ontario Agricultural College. It was not until Lafayette Mendel and Thomas Burr Osborne showed that the nutritional value of soybean seeds could be increased by cooking, moisture or heat, that soy went from a farm animal feed to a human food. William Morse is considered the "father" of modern soybean agriculture in America. He and Charles Piper (Dr. C. V. Piper) took what was an unknown Oriental peasant crop in 1910 and transformed it into a "golden bean" for America becoming one of America's largest farm crops and its most nutritious. Prior to the 1920 in the US, the soybean was mainly a forage crop, a source of oil, meal (for feed) and industrial products, with very little used as food. However, it took on an important role after World War I. During the Great Depression, the drought-stricken (Dust Bowl) regions of the United States were able to use soy to regenerate their soil because of its nitrogen-fixing properties. Farms were increasing production to meet with government demands, and Henry Ford became a promoter of soybeans. He In 1931, Ford hired chemists Robert Boyer and Frank Calvert to produce artificial silk. They succeeded in making a textile fiber of spun soy protein fibers, hardened or tanned in a formaldehyde bath, which was given the name Azlon. It never reached the commercial market. Soybean oil was used to paint the automobiles, as well as fluid for shock absorbers. The soybean arrived in the Caribbean in the form of soy sauce made by Samuel Bowen in Savannah, Georgia, in 1767. It remains only a minor crop there, but its uses for human food are growing steadily. The soybean was first cultivated in Italy by 1760 in the Botanical Garden of Turin. During the 1780s it was grown in at least three other botanical gardens in Italy. In 1935 soybeans are first introduced to Greece by Anton Brillmayer, an Austrian soybean breeder. By 1939, soybeans have been cultivated in Greece. An entire book has been published on the history of soybeans and soyfoods in Greece. Wild soybeans were discovered in northeastern Australia in 1770 by explorers Banks and Solander. In 1804, the first soyfood product ("Fine India Soy" [sauce]) was sold in Sydney. In 1879, the first domesticated soybeans arrived in Australia, a gift of the Minister of the Interior Department, Japan. The soybean was first cultivated in France by 1779 (and perhaps as early as 1740). The two key early people and organizations introducing the soybean to France were the Society of Acclimatization (starting in 1855) and Li Yu-ying (from 1910). Li started a large tofu factory, where the first commercial soyfoods in France were made. The soybean first arrived in Africa via Egypt in 1857. In 1873, Professor Friedrich J. Haberlandt first became interested in soybeans when he obtained the seeds of 19 soybean varieties at the Vienna World Exposition (Wiener Weltausstellung). He cultivated these seeds in Vienna, and soon began to distribute them throughout Central and Western Europe. In 1875, he first grew the soybeans in Vienna, then in early 1876 he sent samples of seeds to seven cooperators in central Europe, who planted and tested the seeds in the spring of 1876, with good or fairly good results in each case. Most of the farmers who received seeds from him cultivated them, then reported their results back to him. Starting in Feb. 1876, he published these results first in various journal articles, and finally in his magnum opus, Die Sojabohne (The Soybean) in 1878. In northern Europe lupin/lupine is known as the "soybean of the north"
A Hitler Youth manual from the 1930s promoted soy beans, which it called "Nazi beans" as an alternative to meat. The soybean is first in cultivated Transcaucasia in Central Asia in 1876, by the Dungans. This region has never been important for soybean production. The first reliable reference to the soybean in this region dates from Mexico in 1877. The soybean first arrived in South America in Argentina in 1882. Andrew McClung showed in the early 1950s that with soil amendments the Cerrado region of Brazil would grow soybeans. The march of soybeans into deforested areas of the Amazon rain forest would come later. Soybeans are one of the "biotech food" crops that have been genetically modified, and genetically modified soybeans are being used in an increasing number of products. In 1995, Monsanto company introduced glyphosate-tolerant soybeans that have been genetically modified to be resistant to Monsanto's glyphosate herbicides through substitution of the Agrobacterium sp. (strain CP4) gene EPSP (5-enolpyruvyl shikimic acid-3-phosphate) synthase. The substituted version is not sensitive to glyphosate. 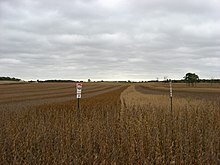 In 1997, about 8% of all soybeans cultivated for the commercial market in the United States were genetically modified. In 2010, the figure was 93%. As with other glyphosate-tolerant crops, concern is expressed over damage to biodiversity. A 2003 study concluded the RR gene had been bred into so many different soybean cultivars, there had been little decline in genetic diversity, but "diversity was limited among elite lines from some companies". The widespread use of such types of GM soybeans in the Americas has caused problems with exports to some regions. GM crops require extensive certification before they can be legally imported into the European Union, where there is considerable supplier and consumer reluctance to use GM products for consumer or animal use. Difficulties with coexistence and subsequent traces of cross-contamination of non-GM stocks have caused shipments to be rejected and have put a premium on non-GM soy. 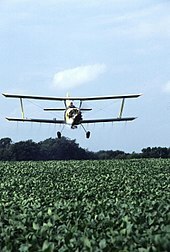 A 2006 United States Department of Agriculture report found the adoption of genetically engineered (GE) soy, corn and cotton reduced the amount of pesticides used overall, but did result in a slightly greater amount of herbicides used for soy specifically. The use of GE soy was also associated with greater conservation tillage, indirectly leading to better soil conservation, as well as increased income from off-farming sources due to the greater ease with which the crops can be managed. Though the overall estimated benefits of the adoption of GE soybeans in the United States was $310 million, the majority of this benefit was experienced by the companies selling the seeds (40%), followed by biotechnology firms (28%) and farmers (20%). The patent on glyphosate-tolerant soybeans expired in 2014, so benefits can be expected to shift. In 2010, a team of American scientists announced they had sequenced the soybean genome—the first legume to be sequenced. Among the legumes, the soybean is valued for its high (38–45%) protein content as well as its high (approximately 20%) oil content. Soybeans are the second-most valuable agricultural export in the United States, behind corn. Approximately 85% of the world's soybean crop is processed into soybean meal and soybean oil, the remainder processed in other ways or eaten whole. Soybeans can be broadly classified as "vegetable" (garden) or field (oil) types. Vegetable types cook more easily, have a mild, nutty flavor, better texture, are larger in size, higher in protein, and lower in oil than field types. Tofu, soy milk, & soy sauce, are among the top edible commodities made using soybeans. Producers prefer the higher protein cultivars bred from vegetable soybeans originally brought to the United States in the late 1930s. The "garden" cultivars are generally not suitable for mechanical combine harvesting because there is a tendency for the pods to shatter upon reaching maturity. Soybean seed contains 18–19% oil. To extract soybean oil from seed, the soybeans are cracked, adjusted for moisture content, rolled into flakes and solvent-extracted with commercial hexane. The oil is then refined, blended for different applications, and sometimes hydrogenated. Soybean oils, both liquid and partially hydrogenated, are exported abroad, sold as "vegetable oil", or end up in a wide variety of processed foods. Soybean meal, or soymeal, is the material remaining after solvent extraction of oil from soybean flakes, with a 50% soy protein content. The meal is 'toasted' (a misnomer because the heat treatment is with moist steam) and ground in a hammer mill. Ninety-seven percent of soybean meal production globally is used as livestock feed. Soybean meal is also used in some dog foods. One of the major uses of soybeans globally is as livestock feed, predominantly in the form of soybean meal. Spring grasses are rich in omega-3 fatty acids, whereas soy is predominantly omega-6. The soybean hulls, which mainly consist of the outer coats of the beans removed before oil extraction, can also be fed to livestock, as well as whole soybean seeds after processing. In addition to their use in livestock feed, soybean products are widely used for human consumption. Common soybean products include soy sauce, soy milk, tofu, soy meal, soy flour, textured vegetable protein (TVP), tempeh, soy lecithin and soybean oil. Soybeans may also be eaten with minimal processing, for example in the Japanese food edamame (枝豆, edamame), in which immature soybeans are boiled whole in their pods and served with salt. In China, Japan, and Korea, soybean and soybean products are a common part of the diet. Tofu (豆腐 dòufu) is thought to have originated in China, along with soy sauce and several varieties of soybean paste used as seasonings. Japanese foods made from soya include miso (味噌), nattō (納豆), kinako (黄粉) and edamame (枝豆), as well as products made with tofu such as atsuage and aburaage. In China, whole dried soybeans are sold in supermarkets and used to cook a variety of dishes, usually after rehydration by soaking in water; they find their use in soup or as a savory dish. In Korean cuisine, soybean sprouts (콩나물 kongnamul) are used in a variety of dishes, and are the base ingredient in doenjang, cheonggukjang and ganjang. In Vietnam, soybeans are used to make soybean paste (tương) in the North with the most popular products are tương Bần, tương Nam Đàn, tương Cự Đà as a garnish for phở and gỏi cuốn dishes, as well as tofu (đậu hũ or đậu phụ or tàu hũ), soy sauce (nước tương), soy milk (nước đậu in the North or sữa đậu nành in the South), and đậu hũ nước đường (tofu sweet soup). In India, textured vegetable protein is often called meal maker or soya chunks and is a popular substitute for meat. Wikimedia Commons has media related to Soybean flour. Soy flour refers to soybeans ground finely enough to pass through a 100-mesh or smaller screen where special care was taken during desolventizing (not toasted) to minimize denaturation of the protein to retain a high protein dispersibility index, for uses such as food extrusion of textured vegetable protein. It is the starting material for production of soy concentrate and soy protein isolate. Soy flour can also be made by roasting the soybean, removing the coat (hull), and grinding into a flour. Soy flour is manufactured with different fat levels. Alternatively, raw soy flour omits the roasting step. Defatted soy flour is obtained from solvent extracted flakes, and contains less than 1% oil. Low-fat soy flour is made by adding some oil back into defatted soy flour. Fat levels range from 4.5% to 9%. High-fat soy flour can also be produced by adding back soybean oil to defatted flour, usually at the level of 15%. Soy lecithin can be added (up to 15%) to soy flour to make lecithinated soy flour. It increases dispersibility and gives it emulsifying properties. Soy flour has 50% protein and 5% fiber. It has higher levels of protein, thiamine, riboflavin, phosphorus, calcium, and iron than wheat flour. It does not contain gluten. As a result, yeast-raised breads made with soy flour are dense in texture. Among many uses, soy flour thickens sauces, prevents staling in baked food, and reduces oil absorption during frying. Baking food with soy flour gives it tenderness, moistness, a rich color, and a fine texture. Soy grits are similar to soy flour except the soybeans have been toasted and cracked into coarse pieces. Kinako is a soy flour used in Japanese cuisine. Soy-based infant formula (SBIF) is sometimes given to infants who are not being strictly breastfed; it can be useful for infants who are either allergic to pasteurized cow milk proteins or who are being fed a vegan diet. It is sold in powdered, ready-to-feed, and concentrated liquid forms. ... no clinical concerns with respect to nutritional adequacy, sexual development, neurobehavioral development, immune development, or thyroid disease. SBIFs provide complete nutrition that adequately supports normal infant growth and development. FDA has accepted SBIFs as safe for use as the sole source of nutrition. Soybeans can be processed to produce a texture and appearance similar to many other foods. For example, soybeans are the primary ingredient in many dairy product substitutes (e.g., soy milk, margarine, soy ice cream, soy yogurt, soy cheese, and soy cream cheese) and meat alternatives (e.g. veggie burgers). These substitutes are readily available in most supermarkets. Soy milk does not naturally contain significant amounts of digestible calcium. Many manufacturers of soy milk sell calcium-enriched products, as well. 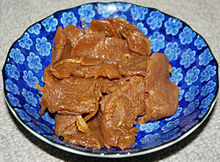 Soy is also used in tempeh: the beans (sometimes mixed with grain) are fermented into a solid cake. Soy products also are used as a low-cost substitute in meat and poultry products. Food service, retail and institutional (primarily school lunch and correctional) facilities regularly use such "extended" products. Extension may result in diminished flavor, but fat and cholesterol are reduced. Vitamin and mineral fortification can be used to make soy products nutritionally equivalent to animal protein; the protein quality is already roughly equivalent. The soy-based meat substitute textured vegetable protein has been used for more than 50 years as a way of inexpensively extending ground beef without reducing its nutritional value. The soybean is used to make a product called soy nut butter which is similar in texture to peanut butter. Sweet boiled beans are popular in Japan and Korea and the sweet boiled soybeans are called as "Daizu no Nimame [ja]" in Japan and Kongjorim (Korean: 콩조림) in Korea. Sweet boiled beans are even used in sweetened buns, especially in Mame Pan [ja]. The boiled and pasted edamame, called Zunda [ja], is used as one of the Sweet bean pastes in Japanese confections. Roasted and ground soybeans can be used as a caffeine-free substitute for coffee. After the soybeans are roasted and ground, they look similar to regular coffee beans or can be used as a powder similar to instant coffee, with aroma and flavor of roasted soybeans. Soybeans with black hulls are used in Chinese fermented black beans, douchi, not to be confused with black turtle beans. Soybeans are also used in industrial products, including oils, soap, cosmetics, resins, plastics, inks, crayons, solvents, and clothing. Soybean oil is the primary source of biodiesel in the United States, accounting for 80% of domestic biodiesel production. Soybeans have also been used since 2001 as fermenting stock in the manufacture of a brand of vodka. In 1936, Ford Motor Company developed a method where soybeans and fibers were rolled together producing a soup which was then pressed into various parts for their cars, from the distributor cap to knobs on the dash board. Ford also informed in public relation releases that in 1935 over five million acres (20,000 km2) was dedicated to growing soybeans in the United States. According to the American Cancer Society, "There is growing evidence that eating traditional soy foods such as tofu may lower the risk of cancers of the breast, prostate, or endometrium (lining of the uterus), and there is some evidence it may lower the risk of certain other cancers." There is insufficient research to indicate whether taking soy dietary supplements has any effect on health or cancer risk. Saponins, a class of natural surfactants (soaps), are sterols that are present naturally in a wide variety of plant foods, including vegetables, legumes, and cereals such as oats. Whole soybeans contain from 0.17 to 6.16% saponins, 0.35 to 2.3% in defatted soy flour and 0.06 to 1.9% in tofu. Legumes such as soybean and chickpeas are the major source of saponins in the human diet. Sources of non-dietary saponins include alfalfa, sunflower, herbs and barbasco. Soy contains isoflavones like genistein and daidzein, and glycitein, an O-methylated isoflavone which accounts for 5–10% of the total isoflavones in soy food products. Glycitein is a phytoestrogen with weak estrogenic activity, comparable to that of the other soy isoflavones. Soy's content of isoflavones are as much as 3 mg/g dry weight. Isoflavones are polyphenol compounds, produced primarily by beans and other legumes, including peanuts and chickpeas. Isoflavones are closely related to flavonoids found in other plants, vegetables and flowers. Soybeans contain the isoflavones, genistein and daidzein, which are phytoestrogen compounds implicated as potentially beneficial factors in cardiovascular diseases and numerous other conditions. No beneficial effects, however, have been shown in clinical research to lower the risk of cardiovascular diseases, including high blood cholesterol levels, prostate cancer or respiratory infections. The dramatic increase in soyfood sales is largely credited to the Food and Drug Administration's (FDA) approval of soy as a cholesterol-lowering food, along with other heart and health benefits. A 1995 review concluded that soy protein is correlated with significant decreases in serum cholesterol, LDL (bad cholesterol) and triglycerides. However, HDL (good cholesterol) did not increase by a significant amount. Soy phytoestrogens (isoflavones: genistein and daidzein) adsorbed onto the soy protein were suggested as the agent reducing serum cholesterol levels. The FDA granted the following health claim for soy: "25 grams of soy protein a day, as part of a diet low in saturated fat and cholesterol, may reduce the risk of heart disease." One serving, (1 cup or 240 mL) of soy milk, for instance, contains 6 or 7 grams of soy protein. Solae resubmitted their original petition, asking for a more vague health claim, after their original was challenged and highly criticized. Solae also submitted a petition for a health claim that soy can help prevent cancer. They quickly withdrew the petition for lack of evidence and after more than 1,000 letters of protest were received. On 18 February 2008, Weston A. Price Foundation submitted a petition for removal of this health claim. 25 g/day soy protein was established as the threshold intake because most trials used at least this much protein and not because less than this amount is inefficacious. In fact, there is evidence suggesting that lower amounts are indeed efficacious. An American Heart Association (AHA) review of a decade long study of soy protein benefits casts doubt on the FDA allowed "Heart Healthy" claim for soy protein and does not recommend isoflavone supplementation. The review panel also found that soy isoflavones have not been shown to reduce post-menopausal "hot flashes" and the efficacy and safety of isoflavones to help prevent cancers of the breast, uterus or prostate is in question. However, AHA concludes that "many soy products should be beneficial to cardiovascular and overall health because of their high content of polyunsaturated fats, fiber, vitamins, and minerals and low content of saturated fat". The AHA did not conduct a formal statistical analysis of the 22 studies upon which they based their estimate of the potency of soy protein. When such an analysis was conducted, Jenkins et al. found that the AHA had considerably underestimated the hypocholesterolemic effects of soy protein. Further, when the analysis was limited to the 11 studies that provided evidence that the control and soy diets were matched, soy protein was found to lower LDL by 5.2 percent. This estimate is in line with the results of other recently published meta-analyses. Furthermore, recent research suggests that soy protein decreases postprandial triglyceride levels, which is increasingly viewed as important for reducing coronary heart disease risk. Soybeans contain a high level of phytic acid, which has many effects including acting as an antioxidant and a chelating agent. The beneficial claims for phytic acid include reducing cancer, minimizing diabetes, and reducing inflammation. However, phytic acid is also criticized for reducing vital minerals absorption due to its chelating effect, especially for diets already low in minerals. Allergy to soy is common, and the food is listed with other foods that commonly cause allergy, such as milk, eggs, peanuts, tree nuts, shellfish. The problem has been reported among younger children, and the diagnosis of soy allergy is often based on symptoms reported by parents and results of skin tests or blood tests for allergy. Only a few reported studies have attempted to confirm allergy to soy by direct challenge with the food under controlled conditions. It is very difficult to give a reliable estimate of the true prevalence of soy allergy in the general population. To the extent that it does exist, soy allergy may cause cases of urticaria and angioedema, usually within minutes to hours of ingestion. In rare cases, true anaphylaxis may also occur. The reason for the discrepancy is likely that soy proteins, the causative factor in allergy, are far less potent at triggering allergy symptoms than the proteins of peanut and shellfish. An allergy test that is positive demonstrates that the immune system has formed IgE antibodies to soy proteins. However, this is only a factor when soy proteins reach the blood without being digested, in sufficient quantities to reach a threshold to provoke actual symptoms. Soy can also trigger symptoms via food intolerance, a situation where no allergic mechanism can be proven. One scenario is seen in very young infants who have vomiting and diarrhoea when fed soy-based formula, which resolves when the formula is withdrawn. Older infants can suffer a more severe disorder with vomiting, diarrhoea that may be bloody, anemia, weight loss and failure to thrive. The most common cause of this unusual disorder is a sensitivity to cow's milk, but soy formulas can also be the trigger. The precise mechanism is unclear and it could be immunologic, although not through the IgE-type antibodies that have the leading role in urticaria and anaphylaxis. However, it is also self-limiting and will often disappear in the toddler years. Soybeans contain isoflavones called genistein and daidzein, which are one source of phytoestrogens in the human diet. Because most naturally occurring phytoestrogens act as selective estrogen receptor modulators, or SERMs, which do not necessarily act as direct agonists of estrogen receptors, normal consumption of foods that contain these phytoestrogens should not provide sufficient amounts to elicit a physiological response in humans. Plant lignans associated with high fiber foods such as cereal brans and beans are the principal precursor to mammalian lignans which have an ability to bind to human estrogen sites. Soybeans are a significant source of mammalian lignan precursor secoisolariciresinol containing 13–273 µg/100 g dry weight. Another phytoestrogen in the human diet with estrogen activity is coumestans, which are found in beans, split-peas, with the best sources being alfalfa, clover, and soybean sprouts. 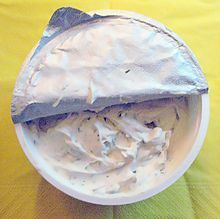 Coumestrol, an isoflavone coumarin derivative, is the only coumestan in foods. Soybeans and processed soy foods are among the richest foods in total phytoestrogens (wet basis per 100 g), which are present primarily in the form of the isoflavones daidzein and genistein. Human breast milk-containing or cow milk formula-containing diets provide 0.005-0.01 mg of isoflavone per day, while soy-based infant formulas provide 6–47 mg of isoflavone daily. This intake is several orders of magnitude greater than those provided by other nutrients. Although considerable research has examined the potential for soy consumption to lower the risk of breast cancer in women, assessment of these studies indicates there is insufficient population evidence to make a conclusion about this relationship as of 2016. A 2001 literature review suggested that women with current or past breast cancer should be aware of the risks of potential tumor growth when taking soy products, based on the effect of phytoestrogens to promote breast cancer cell growth in animals. A 2006 commentary reviewed the relationship with soy and breast cancer, stating that soy may decrease the risk of breast cancer, but cautioned that the impact of isoflavones on breast tissue needs to be evaluated at the cellular level in women at high risk for breast cancer. A high consumption of omega-6 polyunsaturated fatty acids, which are found in most types of vegetable oil including soybean oil, may increase the likelihood that postmenopausal women will develop breast cancer. Another analysis suggests an inverse association between total polyunsaturated fatty acid intake and breast cancer risk. A 2011 analysis of the literature said: "Our study suggests soy isoflavones intake is associated with a significant reduced risk of breast cancer incidence in Asian populations, but not in Western populations." A 2016 review concluded that "current evidence from observational studies and small clinical trials is not robust enough to understand whether soy protein or isoflavone supplements may help prevent or inhibit the progression of prostate cancer." A 2010 review showed that neither soy foods nor isoflavone supplements alter measures of bioavailable testosterone or estrogen concentrations in men. Soy consumption has been shown to have no effect on the levels and quality of sperm. Meta-analyses on the association between soy consumption and prostate cancer risk in men concluded that dietary soy may lower the risk of prostate cancer. Because of mixed results from animal studies and epidemiological studies, a (relatively definitive but expensive) controlled study of the impacts of soy on cognitive skills was performed; it found no impact. Though there is some evidence that estrogen can help protect and repair the brain after injury in rats, there is also evidence that phytoestrogens may be harmful for the recovery of rats in other situations that have sustained brain injury. Similarly, epidemiological evidence of humans eating soya products is currently divided: a study of Japanese men between 1965 and 1999 demonstrated a positive correlation between brain atrophy and consumption of tofu meals. A 2001 literature review noted that disturbing data on soy's effect on the cognitive function of the elderly existed. In 2008, an epidemiological study of 719 Indonesian elderly individuals found that tofu intake was associated with worse memory, but tempeh (a fermented soy product) intake was associated with better memory. The cover article in the Center for Science in the Public Interest's September 2014 newsletter reported that a controlled study at USC prompted by suggestive epidemiological evidence found no impact on cognitive skills of years of soy vs. milk protein diet enrichment. Though raw soy flour is known to be correlated with pancreatic cancer in rats the cooked flour has not been found carcinogenic. Whether soy might promote pancreatic cancer in humans is unknown because studies have not yet attempted to single out soy intake and the incidence of pancreatic cancer in humans, and the amount of soy fed to the rats is proportionately far larger than what humans would normally consume. However, the soy isoflavone genistein has been suggested as a chemopreventive agent against pancreatic cancer, by interfering with the chemical pathways that promote the creation and growth of tumors. The Cancer Council of New South Wales, Australia has released a statement saying scientific research suggests that overall the moderate consumption of soy products does not appear to present a risk to women with breast cancer, and there is equivocal evidence that consuming large amounts of soy products may have a protective effect against developing breast and prostate cancer. However, the Council does not recommend taking soy dietary supplements as there is no evidence they are either effective or safe at preventing or treating cancers. One review noted that soy based foods may inhibit absorption of thyroid hormone medications required for treatment of hypothyroidism. A 2015 scientific review by the European Food Safety Authority concluded that intake of isoflavones from supplements did not affect thyroid hormone levels in postmenopausal women. Soybeans and soy products contain significant amounts of purines, a class of organic compounds. For people who suffer from gout, eating foods containing moderate or high levels of purines may make the condition worse. The U.S. National Institutes of Health (NIH) recommends that gout sufferers limit consumption of soy products (although also suggesting that soy may have health benefits by reducing the risk for heart disease). However, other researchers have found little or no association between consumption of purine-rich vegetables (including beans) and gout. Soybean futures are traded on the Chicago Board of Trade and have delivery dates in January (F), March (H), May (K), July (N), August (Q), September (U), November (X). NCDEX: National Commodity and Derivatives Exchange, India. ^ "Glycine max". Encyclopedia of Life. Retrieved February 16, 2012. ^ Generally written in katakana, not kanji. ^ "Glycine max". Multilingual Multiscript Plant Name Database. Retrieved February 16, 2012. ^ a b Riaz, Mian N. (2006). Soy Applications in Food. Boca Raton, FL: CRC Press. ISBN 978-0-8493-2981-4. ^ "Soybean meal". Retrieved April 16, 2019. ^ a b Hymowitz, T.; Newell, C.A. (July 1, 1981). "Taxonomy of the genusGlycine, domestication and uses of soybeans". Economic Botany. 35 (3): 272–88. doi:10.1007/BF02859119. ISSN 0013-0001. ^ Singh, Ram J.; Nelson, Randall L.; Chung, Gyuhwa (November 2, 2006). Genetic Resources, Chromosome Engineering, and Crop Improvement: Oilseed Crops, Volume 4. London: Taylor & Francis. p. 15. ISBN 978-0-8493-3639-3. ^ Hymowitz, Theodore (August 9, 1995). "Evaluation of Wild Perennial Glycine Species and Crosses For Resistance to Phakopsora". In Sinclair, J.B.; Hartman, G.L. (eds.). Proceedings of the Soybean Rust Workshop. Urbana, IL: National Soybean Research Laboratory. pp. 33–37. ^ Newell, C.A. ; Hymowitz, T. (March 1983). "Hybridization in the Genus Glycine Subgenus Glycine Willd. (Leguminosae, Papilionoideae)". American Journal of Botany. 70 (3): 334–48. doi:10.2307/2443241. JSTOR 2443241. ^ "Neonotonia wightii in Global Plants on JSTOR". ^ "Factsheet – Neonotonia wightii". tropicalforages.info. Archived from the original on June 1, 2017. Retrieved January 19, 2014. ^ Shekhar, Hossain; Uddin, Howlader; Zakir Hossain; Kabir, Yearul (July 22, 2016). Exploring the Nutrition and Health Benefits of Functional Foods. IGI Global. p. 223. ISBN 978-1-5225-0592-1. Retrieved November 22, 2017. ^ Ghulam Raza; Mohan B. Singh; Prem L. Bhalla (June 11, 2017). Atanassov, Atanas (ed.). "In Vitro Plant Regeneration from Commercial Cultivars of Soybean". BioMed Research International. 2017: 7379693. doi:10.1155/2017/7379693. PMC 5485301. PMID 28691031. ^ a b c d e f Purcell, Larry C.; Salmeron, Montserrat; Ashlock, Lanny (2014). "Chapter 2" (PDF). Arkansas Soybean Production Handbook – MP197. Little Rock, AR: University of Arkansas Cooperative Extension Service. pp. 1–8. Retrieved February 21, 2016. ^ a b Purcell, Larry C.; Salmeron, Montserrat; Ashlock, Lanny (2000). "Chapter 19: Soybean Facts" (PDF). Arkansas Soybean Production Handbook – MP197. Little Rock, AR: University of Arkansas Cooperative Extension Service. p. 1. Retrieved September 5, 2016. ^ Bennett, J. Michael; Rhetoric, Emeritus; Hicks, Dale R.; Naeve, Seth L.; Bennett, Nancy Bush (2014). The Minnesota Soybean Field Book (PDF). St Paul, MN: University of Minnesota Extension. p. 33. Archived from the original (PDF) on September 30, 2013. Retrieved September 16, 2016. ^ Shurtleff, William; Aoyagi, Akiko (2015). History of Soybeans and Soyfoods in Sweden, Norway, Denmark and Finland (1735-2015): Extensively Annotated Bibliography and Sourcebook. Lafayette, CA: Soyinfo Center. p. 490. ISBN 978-1-928914-80-8. ^ Blackman, S.A.; Obendorf, R.L. ; Leopold, A.C. (1992). "Maturation Proteins and Sugars in Desiccation Tolerance of Developing Soybean Seeds". Plant Physiology. 100 (1): 225–30. doi:10.1104/pp.100.1.225. PMC 1075542. PMID 16652951. ^ Jim Deacon. "The Nitrogen cycle and Nitrogen fixation". Institute of Cell and Molecular Biology, The University of Edinburgh. ^ Corke, Walker and Wrigley (2004). Encyclopedia of Grain Science. Academic Press. ISBN 978-0-12-765490-4. ^ Circle, Sidney Joseph; Smith, Allan H. (1972). Soybeans: Chemistry and Technology. Westport, CT: Avi Publishing. pp. 104, 163. ISBN 978-0-87055-111-6. ^ a b c "Food Labeling: Health Claims; Soy Protein and Coronary Heart Disease; Docket No. 98P–0683" (PDF). Washington, DC: US Food and Drug Administration; Federal Register, Vol. 64, No. 206. October 26, 1999. ^ Protein Quality Evaluation: Report of the Joint FAO/WHO Expert Consultation. Bethesda, MD: Food and Agriculture Organization of the United Nations (Food and Nutrition Paper No. 51). 1989. ISBN 978-92-5-103097-4. ^ Derbyshire, E.; Wright, D.J. ; Boulter, D. (1976). "Legumin and Vicilin, Storage Proteins of Legume Seeds". Phytochemistry. 15 (1): 3–24. doi:10.1016/S0031-9422(00)89046-9. ^ Danielsson, C.E. (1949). "Seed Globulins of the Gramineae and Leguminosae". The Biochemical Journal. 44 (4): 387–400. doi:10.1042/bj0440387. PMC 1274878. PMID 16748534. ^ a b "Soy Benefits". National Soybean Research Laboratory. Retrieved February 16, 2012. ^ "Subunit structure of the vicilin-like globular storage..." usda.gov. Archived from the original on July 7, 2015. ^ "Cocoa-specific aroma precursors are generated by proteolytic..." usda.gov. Archived from the original on July 7, 2015. ^ Koshino, Lívia L.; Gomes, Clarissa P.; Silva, Luciano P.; Eira, Mirian T.S. ; Bloch Jr., Carlos; Franco, Octávio L.; Mehta, Ângela (November 26, 2008). "Comparative Proteomical Analysis of Zygotic Embryo and Endosperm from Coffea arabica Seeds". J. Agric. Food Chem. 56 (22): 10922–26. doi:10.1021/jf801734m. PMID 18959416. ^ Shutov, A.D. (2011). "Evolution of seed storage globulins and cupin superfamily". Molecular Biology. 45 (4): 529–35. doi:10.1134/S0026893311030162. ^ a b Youle, RJ; Huang, AHC (1981). "Occurrence of low molecular weight and high cysteine containing albumin storage proteins in oilseed of diverse species". Am J Bot. 68 (1): 44–48. doi:10.2307/2442990. JSTOR 2442990. ^ Moreno, FJ; Clemente, A (2008). "2S Albumin Storage Proteins: What Makes them Food Allergens?". Open Biochem J. 2: 16–28. doi:10.2174/1874091X00802010016. PMC 2570561. PMID 18949071. ^ Seber, LE; Barnett, BW; McConnell, EJ; et al. (2012). "Scalable purification and characterization of the anticancer lunasin peptide from soybean". PLoS ONE. 7 (4): e35409. Bibcode:2012PLoSO...735409S. doi:10.1371/journal.pone.0035409. PMC 3326064. PMID 22514740. ^ "Soy peptide lunasin has anti-cancer, anti-inflammatory properties". ^ "AllFam – AllFam Allergen Family Factsheet". meduniwien.ac.at. Archived from the original on March 4, 2016. ^ Obendorf; l, Ralph; Suzanne, Kosina (2011). Soybean – Biochemistry, Chemistry and Physiology. intechopen.com. doi:10.5772/15110. ISBN 978-953-307-219-7. ^ Wang, Feng-Qing; Yao, Kang; Wei, Dong-Zhi (2011). Soybean and Health. intechopen.com. doi:10.5772/18808. ISBN 978-953-307-535-8. ^ Vesper, Hubert; Schmelz, Eva-Maria; Nikolova-Karakashian, Mariana N.; Dillehay, Dirck L.; Lynch, Daniel V.; Merrill, Alfred H. (July 1, 1999). "Sphingolipids in Food and the Emerging Importance of Sphingolipids to Nutrition". J. Nutr. 129 (7): 1239–50. doi:10.1093/jn/129.7.1239. PMID 10395583 – via jn.nutrition.org. ^ Fargione, Joseph; Hill, Jason; Tilman, David; Polasky, Stephen; Hawthorne, Peter (February 2008). "Land Clearing and the Biofuel Carbon Debt". Science. 319 (5867): 1235–38. Bibcode:2008Sci...319.1235F. doi:10.1126/science.1152747. PMID 18258862. ^ "Big Business Leaves Big Forest Footprints". BBC News. February 16, 2010. ^ Robbins, Jim (October 11, 2015). "Deforestation and Drought". The New York Times. ^ "How Animal Agriculture Affects Our Planet". pachamama.org. ^ "This Is How Animal Agriculture Causes Deforestation". onegreenplanet.org. June 5, 2014. ^ Lang, Susan (June 21, 2006). "Cornell Alumnus Andrew Colin McClung Reaps 2006 World Food Prize". Chronicle Online. Cornell University. Retrieved February 18, 2012. ^ Pearce, Fred (April 14, 2011). "The Cerrado: Brazil's Other Biodiverse Region Loses Ground". Yale University. Retrieved February 18, 2012. ^ a b "Soy in the Amazon". vqronline.org. ^ Alves, Bruno J.R.; Boddey, Robert M.; Urquiaga, Segundo (2003). "The success of BNF in soybean in Brazil". Plant and Soil. 252: 1–9. doi:10.1023/A:1024191913296. ^ McBride, M.B. ; Richards, B.K. ; Steenhuis, T.; Spiers, G. (May – June 2000). "Molybdenum Uptake by Forage Crops Grown on Sewage Sludge-Amended Soils in the Field and Greenhouse" (PDF). Journal of Environmental Quality. 29 (3): 848–54. doi:10.2134/jeq2000.00472425002900030021x. ^ Heckman, J.R.; Angle, J.S. ; Chaney, R.L. (December 9, 1985). "Residual Effects of Sewage Sludge on Soybean: II. Accumulation of Soil and Symbiotically Fixed Nitrogen". Journal of Environmental Quality. 16 (2): 118–24. doi:10.2134/jeq1987.00472425001600020005x. ^ Herbert, Ames, Cathy Hull, and Eric Day. "Corn Earworm Biology and Management in Soybeans." Virginia Cooperative Extension, Virginia State University (2009). ^ "World Agricultural Outlook Report" (PDF). www.usda.gov. Retrieved May 20, 2018. ^ "Global Soybean Production, 2016 Forecast (USDA)". GlobalSoyabeanProduction.com. 2016. Retrieved May 22, 2016. ^ a b c "Soybeans, Production/Crops/World for 2014". Food and Agricultural Organization of the United Nations, Statistics Division (FAOSTAT). 2015. Retrieved May 23, 2016. ^ Patel, Raj (2008). Stuffed & Starved from Farm to Fork: The Hidden Battle for the World Food System. London: Portobello Books Ltd. pp. 169–73. ISBN 978-1-933633-49-7. ^ Wik, Reynold Millard (Summer 1962). "Henry Ford's Science and Technology for Rural America". Technology and Culture. 3 (3): 247–58. doi:10.2307/3100818. JSTOR 3100818. ^ Baohui Song; Mary A. Marchant; Shuang Xu (2006). "Competitive Analysis of Chinese Soybean Import Suppliers – U.S., Brazil, and Argentina" (PDF). American Agricultural Economics Association Annual Meetings. Research in Agricultural & Applied Economics, University of Minnesota. Archived from the original (PDF) on September 5, 2013. ^ Shurtleff, William; Aoyagi, Akiko. 2013. History of Whole Dry Soybeans, Used as Beans, or Ground, Mashed or Flaked (240 BCE to 2013). Lafayette, California. 950 pp. ^ Lee, Gyoung-Ah; Crawford, Gary W.; Liu, Li; Sasaki, Yuka; Chen, Xuexiang (November 4, 2011). "Archaeological Soybean (Glycine max) in East Asia: Does Size Matter?". PLoS ONE. 6 (11): e26720. Bibcode:2011PLoSO...626720L. doi:10.1371/journal.pone.0026720. PMC 3208558. PMID 22073186. ^ "Soybean". Encyclopædia Britannica Online. Retrieved February 18, 2012. ^ "History of Soybeans". Soya – Information about Soy and Soya Products. Retrieved February 18, 2012. ^ a b c d Lee, GA; Crawford, GW; Liu, L; Sasaki, Y; Chen, X (2011). "Archaeological Soybean (Glycine max) in East Asia: Does Size Matter?". PLOS ONE. 6 (11): e26720. Bibcode:2011PLoSO...626720L. doi:10.1371/journal.pone.0026720. PMC 3208558. PMID 22073186. ^ Siddiqi, Mohammad Rafiq. Tylenchida: Parasites of Plants and Insects. New York: CABI Pub. 389. p. (2001). ^ Lee G‐A, Crawford GW, Liu L, Sasaki Y, Chen X. 2011. Archaeological soybean (Glycine max) in East Asia: does size matter? PLoS ONE 6: e26720. ^ Zhao Z. 2004. Floatation: a paleobotanic method in field archaeology. Archaeology3: 80–87. ^ a b Stark, Miriam T. (2005). Archaeology of Asia (Blackwell Studies in Global Archaeology). Hoboken, NJ: Wiley-Blackwell. p. 81. ISBN 978-1-4051-0213-1. Retrieved February 18, 2012. ^ Murphy, Denis J. (2007). People, Plants and Genes: The Story of Crops and Humanity. New York: Oxford University Press. pp. 122–23. ^ "History of Soymilk and Dairy-like Soymilk Products". Soy Info Center. 2007. Retrieved February 18, 2012. ^ "Chronology of Tofu Worldwide 965 A.D. to 1929". Soy Info Center. Retrieved February 18, 2012. ^ "kedelai translate Indonesian to English: Cambridge Dictionary". dictionary.cambridge.org. Retrieved January 21, 2018. ^ Hendri F. Isnaeni (July 9, 2014). "Sejarah Tempe" (in Indonesian). Historia. Retrieved January 21, 2018. ^ Shurtleff, William; Aoyagi, Akiko (2010). History of Soybeans and Soyfoods in Southeast Asia (1770–2010). Soy Info Center. ISBN 978-1-928914-30-3. Retrieved February 18, 2012. ^ Shurtleff, William; Aoyagi, Akiko (2010). History of Soybeans and Soyfoods in South Asia / Indian Subcontinent (1656–2010). Soy Info Center. ISBN 978-1-928914-31-0. Retrieved February 18, 2012. ^ Chaplin, J.E. (1996). An Anxious Pursuit: Agricultural Innovation and Modernity in the Lower South, 1730–1815. University of North Carolina Press. p. 147. ISBN 978-0-8078-4613-1. ^ Hymowitz, T. (October 1, 1970). "On the domestication of the soybean". Economic Botany. 24 (4): 408–21. doi:10.1007/BF02860745. ISSN 0013-0001. ^ Roger Boerma. "Another First for Georgia Agriculture" (PDF). caes.uga.edu. Georgia Soybean News. p. 5. Archived from the original (PDF) on September 23, 2015. ^ "Soybeans planted first in Georgia". Google News Archive. The Rockmart Journal. August 21, 1994. ^ Eat Your Food! Gastronomical Glory from Garden to Gut: A Coastalfields Cookbook, Nutrition Textbook, Farming Manual and Sports Manual. Coastalfields Press. April 2007. ISBN 978-0-9785944-8-0. Retrieved May 4, 2013. ^ Shurtleff, William; Aoyagi, Akiko (2010). History of Soybeans and Soyfoods in Canada (1831–2010). Soy Info Center. ISBN 978-1-928914-28-0. Retrieved February 18, 2012. ^ "The Kunitz Soybean Variety". uiuc.edu. February 20, 2018. ^ "Scientists create new low-allergen soybean". illinois.edu. Archived from the original on June 5, 2015. ^ "William J. Morse and Charles V. Piper". soyinfocenter.com. ^ "William J. Morse – History of His Work with Soybeans and Soyfoods (1884–1959) – SoyInfo Center". soyinfocenter.com. ^ Piper, Charles V.; Morse, William J. (1923). The Soybean. Agricultural and Biological Publications. New York: McGraw-Hill Book Company. OCLC 252589754 – via google.com. ^ Joe Schwarcz (2004). The Fly in the Ointment: 63 Fascinating Commentaries on the Science of Everyday Life. ECW Press. p. 193. ISBN 978-1-55022-621-8. Retrieved May 4, 2013. ^ Roth, Matthew (2018). Magic Bean: The Rise of Soy in America. Lawrence, KS: University Press of Kansas. ISBN 978-0-7006-2633-5. OCLC 1012618664. ^ Shurtleff, William; Aoyagi, Akiko. History of Soybeans and Soyfoods in the Caribbean / West Indies (1767–2008). Soy Info Center. Retrieved February 18, 2012. ^ Shurtleff, W.; Aoyagi, A. 2015. "History of Soybeans and Soyfoods in Greece, the European Union and Small Western European Countries (1939-2015)." Lafayette, California: Soyinfo Center. 243 pp. (462 references; 20 photos and illustrations. Free online. ISBN 978-1-928914-81-5). ^ Shurtleff, William; Aoyagi, Akiko (2010). History of Soybeans and Soyfoods in Australia, New Zealand and Oceania (1770–2010). Soy Info Center. ISBN 978-1-928914-29-7. Retrieved February 18, 2012. ^ Shurtleff, W.; Aoyagi, A.; 2015. "History of Soybeans and Soyfood in France (1665-2015)". Lafayette, California; Soyinfo Center. 1,202 pp. (3,405 references; 145 photos and illustrations. Free online). ^ Shurtleff, William; Aoyagi, Akiko (2009). History of Soybeans and Soyfoods in Africa (1857–2009). Soy Info Center. ISBN 978-1-928914-25-9. Retrieved February 18, 2012. ^ Shurtleff, W.; Aoyagi, A. 2015. "History of Soybeans and Soyfoods in Austria and Switzerland (1781-2015)." Lafayette, California: Soyinfo Center. 705 pp. (1444 references; 128 photos and illustrations). Free online. ISBN 978-1-928914-77-8. ^ Ross, Kate (November 16, 2011). "Soy Substitute Edges Its Way Into European Meals". New York Times. Retrieved February 28, 2015. ^ "Hitler's food taster speaks of Führer's vegetarian diet". telegraph.co.uk. ^ Shurtleff, William; Aoyagi, Akiko. History of Soybeans and Soyfoods in Central Asia (1876–2008). Soy Info Center. Retrieved February 18, 2012. ^ Shurtleff, William; Aoyagi, Akiko. "History of Soybeans and Soyfoods in Mexico and Central America (1877–2009)". Soy Info Center. Retrieved February 18, 2012. ^ Shurtleff, William; Aoyagi, Akiko (2009). History of Soybeans and Soyfoods in South America (1882–2009). Soy Info Center. ISBN 978-1-928914-23-5. Retrieved February 18, 2012. ^ "Cornell alumnus Andrew Colin McClung reaps 2006 World Food Prize". news.cornell.edu – Cornell Chronicle. ^ Padgette, S.R. ; Kolacz, K.H. ; Delannay, X.; Re, D.B. ; Lavallee, B.J. ; Tinius, C.N. ; Rhodes, W.K. ; Otero, Y.I. ; et al. (1995). "Development, Identification, and Characterization of a Glyphosate-Tolerant Soybean Line". Crop Science. 35 (5): 1451–61. doi:10.2135/cropsci1995.0011183X003500050032x. ^ National Agricultural Statistics Board annual report, June 30, 2010. Retrieved July 23, 2010. ^ Liu, KeShun (1997). Soybeans: Chemistry, Technology, and Utilization. Berlin: Springer. p. 532. ISBN 978-0-8342-1299-2. ^ Sneller CH (2003). "Impact of Transgenic Genotypes and Subdivision on Diversity Within Elite North American Soybean Germplasm". Crop Science. 43: 409–14. doi:10.2135/cropsci2003.0409. ^ "EU Caught in Quandary Over GMO Animal Feed Imports". The Guardian. December 7, 2007. ^ Fernandez-Cornejo, J.; Caswell, Margriet (April 1, 2006). "The First Decade of Genetically Engineered Crops in the United States" (PDF). United States Department of Agriculture. Archived from the original (PDF) on June 22, 2010. Retrieved February 18, 2012. ^ Pollack, Andrew (December 18, 2009). "As Patent Ends, a Seed's Use Will Survive". The New York Times. ^ "Cooperative Extension ‹ Log In". ^ Schmutz, Jeremy; Cannon, Steven B.; Schlueter, Jessica; Ma, Jianxin; Mitros, Therese; Nelson, William; Hyten, David L.; Song, Qijian; Thelen, Jay J.; Cheng, Jianlin; Xu, Dong; Hellsten, Uffe; May, Gregory D.; Yu, Yeisoo; Sakurai, Tetsuya; Umezawa, Taishi; Bhattacharyya, Madan K.; Sandhu, Devinder; Valliyodan, Babu; Lindquist, Erika; Peto, Myron; Grant, David; Shu, Shengqiang; Goodstein, David; Barry, Kerrie; Futrell-Griggs, Montona; Abernathy, Brian; Du, Jianchang; Tian, Zhixi; Zhu, Liucun; Gill, Navdeep; Joshi, Trupti; Libault, Marc; Sethuraman, Anand; Zhang, Xue-Cheng; Shinozaki, Kazuo; Nguyen, Henry T.; Wing, Rod A.; Cregan, Perry; Specht, James; Grimwood, Jane; Rokhsar, Dan; Stacey, Gary; Shoemaker, Randy C.; Jackson, Scott A. (January 14, 2010). "Genome sequence of the palaeopolyploid soybean". Nature. 463 (7278): 178–83. Bibcode:2010Natur.463..178S. doi:10.1038/nature08670. ISSN 1476-4687. OCLC 01586310. PMID 20075913. ^ "Soybean Genome Sequenced: Analysis Reveals Pathways for Improving Biodiesel, Disease Resistance, and Reducing Waste Runoff". Science Daily. January 13, 2010. Retrieved February 18, 2012. ^ "Soy Facts". Soyatech. Archived from the original on January 12, 2017. Retrieved January 24, 2017. ^ a b "Livestock's long shadow: environmental issues and options". www.fao.org. Retrieved January 15, 2016. ^ Lusas, Edmund W.; Riaz, Mian N. (1995). "Soy Protein Products: Processing and Use" (PDF). Journal of Nutrition (125): 573S–80S. Archived from the original (PDF) on December 7, 2012. Retrieved January 20, 2013. ^ a b c d e f g Lim 2012, p. 637. ^ Mustakas, G.C. (1964). "Production and nutritional evaluation of extrusion-cooked full-fat soybean flour". Journal of the American Oil Chemists' Society. 41 (9): 607–14. doi:10.1007/BF02664977. ^ Mustakas, GUS C.; Griffin, Edward L.; Sohns, Virgil E. (1966). "Full-Fat Soybean Flours by Continuous Extrusion Cooking". World Protein Resources. Advances in Chemistry. 57. pp. 101–11. doi:10.1021/ba-1966-0057.ch008. ISBN 978-0-8412-0058-6. ^ "Whole Wheat Bread Recipe: McCay's Miracle Loaf – Real Food". Mother Earth News. ^ "Cornell Bread A Heavyweight When It Comes To Nutrition And Fiber". ^ "Technology of production of edible flours and protein products from soybeans. Chapter 4". ^ Miniello, VL; Moro, GE; Tarantino, M; Natile, M; Granieri, L; Armenio, L (2003). "Soy-based Formulas and Phyto-oestrogens: A Safety Profile". Acta Paediatrica. 91 (441): 93–100. doi:10.1111/j.1651-2227.2003.tb00655.x. PMID 14599051. ^ Giampietro, P.G. ; Bruno, G.; Furcolo, G.; Casati, A.; Brunetti, E.; Spadoni, G.L. ; Galli, E. (2004). "Soy Protein Formulas in Children: No Hormonal Effects in Long-term Feeding". Journal of Pediatric Endocrinology and Metabolism. 17 (2): 191–96. doi:10.1515/JPEM.2004.17.2.191. PMID 15055353. ^ Strom, B.L. ; Schinnar, R; Ziegler, EE; Barnhart, KT; Sammel, MD; MacOnes, GA; Stallings, VA; Drulis, JM; et al. (2001). "Exposure to Soy-Based Formula in Infancy and Endocrinological and Reproductive Outcomes in Young Adulthood". JAMA: The Journal of the American Medical Association. 286 (7): 807–14. doi:10.1001/jama.286.7.807. PMID 11497534. ^ a b Merritt, Russell J.; Jenks, Belinda H. (2004). "Safety of Soy-Based Infant Formulas Containing Isoflavones: The Clinical Evidence". The Journal of Nutrition. 134 (5): 1220S–24S. doi:10.1093/jn/134.5.1220S. PMID 15113975. ^ Hoogenkamp, Henk W. (2005). Soy Protein and Formulated Meat Products. Wallingford, Oxon: CABI Publishing. p. 14. ISBN 978-0-85199-864-0. Retrieved February 18, 2012. ^ Endres, Joseph G. (2001). Soy Protein Products. Champaign-Urbana, IL: AOCS Publishing. pp. 43–44. ISBN 978-1-893997-27-1. Retrieved February 18, 2012. ^ Circle, Sidney Joseph; Smith, Allan H. (1972). Soybeans: Chemistry and Technology. Westport, CT: Avi Publishing. pp. 7, 350. ISBN 978-0-87055-111-6. Retrieved February 18, 2012. ^ Liu, KeShun (1997). Soybeans : Chemistry, Technology, and Utilization. Gaithersburg, MD: Aspen Publishers. p. 69. ISBN 978-0-8342-1299-2. Retrieved February 18, 2012. ^ "Soy fact sheets: soy nut butter". Soyfoods Association of North America, Washington, DC. 2016. Retrieved November 1, 2016. ^ William Shurtleff, Akiko Aoyagi (2013). History of Whole Dry Soybeans, Used as Beans, or Ground, Mashed or Flaked (240 BCE to 2013); see page 254. Soyinfo Center. ISBN 978-1-928914-57-0. ^ "Sustainability Fact Sheet" (PDF). National Biodiesel Board. April 2008. Retrieved February 18, 2012. ^ "How Vodka is Made". Martini Muse. Retrieved February 18, 2012. ^ "Soy Bean Soup is Pressed into Auto Parts". Popular Mechanics. 64 (4): 513. April 1936. ISSN 0032-4558. ^ "How Your Diet May Affect Your Risk of Breast Cancer". American Cancer Society. October 1, 2018. Retrieved March 16, 2019. ^ a b c d e f g h "Soy isoflavones". Micronutrient Information Center, Linus Pauling Institute, Oregon State University, Corvallis. 2016. Retrieved May 23, 2016. ^ Moses, T; Papadopoulou, K.K. ; Osbourn, A (2014). "Metabolic and functional diversity of saponins, biosynthetic intermediates and semi-synthetic derivatives". Critical Reviews in Biochemistry and Molecular Biology. 49 (6): 439–62. doi:10.3109/10409238.2014.953628. PMC 4266039. PMID 25286183. ^ Song TT, Hendrich S, Murphy PA (1999). "Estrogenic activity of glycitein, a soy isoflavone". Journal of Agricultural and Food Chemistry. 47 (4): 1607–10. doi:10.1021/jf981054j. PMID 10564025. ^ a b c Sacks, F.M. ; Lichtenstein, A.; Van Horn, L.; Harris, W.; Kris-Etherton, P.; Winston, M.; American Heart Association Nutrition Committee (February 21, 2006). "Soy Protein, Isoflavones, and Cardiovascular Health: An American Heart Association Science Advisory for Professionals from the Nutrition Committee". Circulation. 113 (7): 1034–44. doi:10.1161/CIRCULATIONAHA.106.171052. PMID 16418439. ^ Qin Y, Niu K, Zeng Y, Liu P, Yi L, Zhang T, Zhang QY, Zhu JD, Mi MT (2013). "Isoflavones for hypercholesterolaemia in adults". Cochrane Database Syst Rev. 6 (6): CD009518. doi:10.1002/14651858.CD009518.pub2. PMID 23744562. ^ Anderson, James W.; Johnstone, Bryan M.; Cook-Newell, Margaret E. (1995). "Meta-Analysis of the Effects of Soy Protein Intake on Serum Lipids". New England Journal of Medicine. 333 (5): 276–82. doi:10.1056/NEJM199508033330502. PMID 7596371. ^ "Study Casts Doubt On Soy's Health Benefits". Consumer Affairs. August 3, 2005. Archived from the original on March 8, 2012. ^ "RE: Docket No. 2007N0-464" (PDF). Weston A. Price Foundation. Archived from the original (PDF) on October 10, 2009. Retrieved February 19, 2012. ^ Messina, M.J. (March 2003). "Potential Public Health Implications of the Hypocholesterolemic Effects of Soy Protein". Nutrition (Burbank, CA). 19 (3): 280–81. doi:10.1016/S0899-9007(02)00995-4. PMID 12620535. ^ Jenkins, David J.A. ; Mirrahimi, Arash; Srichaikul, Korbua; Berryman, Claire E.; Wang, Li; Carleton, Amanda; Abdulnour, Shahad; Sievenpiper, John L.; et al. (December 2010). "Soy Protein Reduces Serum Cholesterol by Both Intrinsic and Food Displacement Mechanisms". The Journal of Nutrition. 140 (12): 2302S–11S. doi:10.3945/jn.110.124958. PMID 20943954. ^ Zhan, Siyan; Ho, Suzanne C. (December 2005). "Meta-Analysis of the Effects of Soy Protein Containing Isoflavones on the Lipid Profile". American Journal of Clinical Nutrition. 81 (2): 397–408. doi:10.1093/ajcn.81.2.397. PMID 15699227. ^ Harland, J.I. ; Haffner, T.A. (September 2008). "Systematic Review, Meta-analysis and Regression of Randomised Controlled Trials Reporting an Association Between an Intake of Circa 25 g Soya Protein Per Day and Blood Cholesterol". Atherosclerosis. 200 (1): 13–27. doi:10.1016/j.atherosclerosis.2008.04.006. PMID 18534601. ^ Reynolds, K.; Chin, A.; Lees, K.A. ; Nguyen, A.; Bujnowski, D.; He, J. (September 2006). "A Meta-analysis of the Effect of Soy Protein Supplementation on Serum Lipids". The American Journal of Cardiology. 98 (5): 633–40. doi:10.1016/j.amjcard.2006.03.042. PMID 16923451. ^ Santo, Antonio S.; Santo, Ariana M.; Browne, Richard W.; Burton, Harold; Leddy, John J.; Horvath, Steven M.; Horvath, Peter J. (December 2010). "Postprandial Lipemia Detects the Effect of Soy Protein on Cardiovascular Disease Risk Compared with the Fasting Lipid Profile". Lipids. 45 (12): 1127–1138. doi:10.1007/s11745-010-3487-z. PMID 20981505. ^ Vucenik, Ivana; Shamsuddin, AbulKalam M. (November 2003). "Cancer Inhibition by Inositol Hexaphosphate (IP6) and Inositol: From Laboratory to Clinic". The Journal of Nutrition. 133 (11): 3778S–84S. doi:10.1093/jn/133.11.3778S. PMID 14608114. ^ Yoon, Jane H.; Thompson, Lilian U.; Jenkins, David J.A. (December 1983). "The Effect of Phytic Acid on In Vitro Rate of Starch Digestibility and Blood Glucose Response". American Journal of Clinical Nutrition. 38 (6): 835–42. doi:10.1093/ajcn/38.6.835. PMID 6650445. ^ Sudheer, Kumar M.; Sridhar, Reddy B.; Kiran, Babu S.; Bhilegaonkar, P.M.; Shirwaikar, A.; Unnikrishnan, M.K. (February 2004). "Antiinflammatory and Antiulcer Activities of Phytic Acid in Rats". Indian Journal of Experimental Biology. 42 (2): 179–85. PMID 15282951. ^ Cantani, A.; Lucenti P. (August 1997). "Natural History of Soy Allergy and/or Intolerance in Children, and Clinical Use of Soy-protein Formulas". Pediatric Journal of Allergy and Clinical Immunology. 8 (2): 59–74. doi:10.1111/j.1399-3038.1997.tb00146.x. PMID 9617775. ^ Cordle, C.T. (May 2004). "Soy Protein Allergy: Incidence and Relative Severity". Journal of Nutrition. 134 (5): 1213S–19S. doi:10.1093/jn/134.5.1213S. PMID 15113974. ^ Sampson, H.A. (May 1999). "Food Allergy, Part 1: Immunopathogenesis and Clinical Disorders". The Journal of Allergy and Clinical Immunology. 103 (5): 717–28. doi:10.1016/S0091-6749(99)70411-2. PMID 10329801. ^ Mitchell, Julie H.; Cawood, Elizabeth; Kinniburgh, David; Provan, Anne; Collins, Andrew R.; Irvine, D. Stewart (June 2001). "Effect of a Phytoestrogen Food Supplement on Reproductive Health in Normal Males". Clinical Science. 100 (6): 613–18. doi:10.1042/CS20000212. PMID 11352776. ^ Oseni, T; Patel, R; Pyle, J; Jordan, VC (2008). "Selective Estrogen Receptor Modulators and Phytoestrogens". Planta Med. 74 (13): 1656–65. doi:10.1055/s-0028-1088304. PMC 2587438. PMID 18843590. ^ Adlercreutz, H.; Mazur, W.; Bartels, P.; Elomaa, V.; Watanabe, S.; Wähälä, K.; Landström, M.; Lundin, E.; et al. (March 2000). "Phytoestrogens and Prostate Disease". The Journal of Nutrition. 130 (3): 658S–59S. doi:10.1093/jn/130.3.658S. PMID 10702603. ^ De Kleijn, M.J.; Van Der Schouw, Y.T. ; Wilson, P.W. ; Grobbee, D.E. ; Jacques, P.F. (February 2002). "Dietary Intake of Phytoestrogens is Associated With a Favorable Metabolic Cardiovascular Risk Profile in Postmenopausal U.S. Women: The Framingham Study". The Journal of Nutrition. 132 (2): 276–82. doi:10.1093/jn/132.2.276. PMID 11823590. ^ Valsta, L.M. ; Kilkkinen, A.; Mazur, W.; Nurmi, T.; Lampi, A-M.; Ovaskainen, M-L.; Korhonen, T.; Adlercreutz, H.; et al. (June 2003). "Phyto-oestrogen Database of Foods and Average Intake in Finland". British Journal of Nutrition. 89 (5): S31–S38. doi:10.1079/BJN2002794. PMID 12725654. ^ Thompson, Lilian U.; Boucher, Beatrice A.; Liu, Zhen; Cotterchio, Michelle; Kreiger, Nancy (2006). "Phytoestrogen Content of Foods Consumed in Canada, Including Isoflavones, Lignans, and Coumestan". Nutrition and Cancer. 54 (2): 184–201. doi:10.1207/s15327914nc5402_5. PMID 16898863. ^ Napier, India D., et al. "Testicular Development in Male Rats Is Sensitive to a Soy-Based Diet in the Neonatal Period." Biology of reproduction (2014): biolreprod-113. ^ De Lemos, Mário L (September 2001). "Effects of Soy Phytoestrogens Genistein and Daidzein on Breast Cancer Growth". Annals of Pharmacotherapy. 35 (9): 1118–21. doi:10.1345/aph.10257. PMID 11573864. ^ Messina, M.; McCaskill-Stevens, W.; Lampe, J.W. (September 2006). "Addressing the Soy and Breast Cancer Relationship: Review, Commentary, and Workshop Proceedings". JNCI Journal of the National Cancer Institute. 98 (18): 1275–84. doi:10.1093/jnci/djj356. PMID 16985246. ^ Sonestedt, Emily; Ericson, Ulrika; Gullberg, Bo; Skog, Kerstin; Olsson, Håkan; Wirfält, Elisabet (October 2008). "Do Both Heterocyclic Amines and Omega-6 Polyunsaturated Fatty Acids Contribute to the Incidence of Breast Cancer in Postmenopausal Women of the Malmö Diet and Cancer Cohort?". International Journal of Cancer. 123 (7): 1637–43. doi:10.1002/ijc.23394. PMID 18636564. ^ Pala, V.; Krogh, V.; Muti, P.; Chajès, V.; Riboli, E.; Micheli, A.; Saadatian, M.; Sieri, S.; et al. (July 2001). "Erythrocyte Membrane Fatty Acids and Subsequent Breast Cancer: A Prospective Italian Study". Journal of the National Cancer Institute. 93 (14): 1088–95. doi:10.1093/jnci/93.14.1088. PMID 11459870. ^ Dong, Jia-Yi; Qin, Li-Qiang (January 2011). "Soy Isoflavones Consumption and Risk of Breast Cancer Incidence or Recurrence: A Meta-analysis of Prospective Studies". Breast Cancer Research and Treatment. 125 (2): 315–323. doi:10.1007/s10549-010-1270-8. PMID 21113655. ^ Hamilton-Reeves, Jill M.; Vazquez, Gabriela; Duval, Sue J.; Phipps, William R.; Kurzer, Mindy S.; Messina, Mark J. (2010). "Clinical studies show no effects of soy protein or isoflavones on reproductive hormones in men: Results of a meta-analysis". Fertility and Sterility. 94 (3): 997–1007. doi:10.1016/j.fertnstert.2009.04.038. PMID 19524224. ^ Messina, Mark (2010). "Soybean isoflavone exposure does not have feminizing effects on men: A critical examination of the clinical evidence". Fertility and Sterility. 93 (7): 2095–2104. doi:10.1016/j.fertnstert.2010.03.002. PMID 20378106. ^ Yan, Lin; Spitznagel, Edward L (2009). "Soy consumption and prostate cancer risk in men: a revisit of a meta-analysis". The American Journal of Clinical Nutrition. 89 (4): 1155–63. doi:10.3945/ajcn.2008.27029. PMID 19211820. ^ van Die, MD; Bone, KM; Williams, SG; Pirotta, MV (2014). "Soy and soy isoflavones in prostate cancer: a systematic review and meta-analysis of randomized controlled trials". BJU International. 113 (5b): E119–30. doi:10.1111/bju.12435. ISSN 1464-4096. PMID 24053483. ^ File, Sandra E.; Hartley, David E.; Alom, Nazmul; Rattray, Marcus (February 2003). "Soya Phytoestrogens Change Cortical and Hippocampal Expression of BDNF mRNA in Male Rats". Neuroscience Letters. 338 (2): 135–38. doi:10.1016/S0304-3940(02)01391-5. PMID 12566171. ^ White, Lon R.; Petrovitch, Webster; Ross, GW; Masaki, Kamal; Hardman, John; Nelson, James; Davis, Daron; Markesbery, William (April 2000). "Brain Aging and Midlife Tofu Consumption". Journal of the American College of Nutrition. 19 (2): 242–55. doi:10.1080/07315724.2000.10718923. PMID 10763906. Archived from the original on April 15, 2013. ^ Sirtori, C.R. (2001). "Risks and Benefits of Soy Phytoestrogens in Cardiovascular Diseases, Cancer, Climacteric Symptoms and Osteoporosis". Drug Safety. 24 (9): 665–82. doi:10.2165/00002018-200124090-00003. PMID 11522120. ^ Hogervorst, E.; Sadjimim, T.; Yesufu, A.; Kreager, P.; Rahardjo, T.B. (2008). "High Tofu Intake is Associated with Worse Memory in Elderly Indonesian Men and Women". Dementia and Geriatric Cognitive Disorders. 26 (1): 50–57. doi:10.1159/000141484. PMID 18583909. ^ Dethloff, L.; Barr, B.; Bestervelt, L.; Bulera, S.; Sigler, R.; Lagattuta, M.; De La Iglesia, F. (May 2000). "Gabapentin-Induced Mitogenic Activity in Rat Pancreatic Acinar Cells". Toxicological Sciences. 55 (1): 52–59. doi:10.1093/toxsci/55.1.52. PMID 10788559. ^ Roebuck, B.D. ; Kaplita, P.V. ; Edwards, B.R. ; Praissman, M. (March 1987). "Effects of Dietary Fats and Soybean Protein on Azaserine-induced Pancreatic Carcinogenesis and Plasma Cholecystokinin in the Rat". Cancer Research. 47 (5): 1333–38. PMID 3815341. ^ Roebuck, B.D. (1986). "Enhancement of Pancreatic Carcinogenesis by Raw Soy Protein Isolate: Quantitative Rat Model and Nutritional Considerations". Nutritional and Toxicological Significance of Enzyme Inhibitors in Foods. Advances in Experimental Medicine and Biology. 199. Kluwer Academic. pp. 91–107. doi:10.1007/978-1-4757-0022-0_5. ISBN 978-1-4757-0024-4. PMID 3799291. ^ Sarkar, F.; Banerjee, S.; Li, Y. (November 2007). "Pancreatic Cancer: Pathogenesis, Prevention and Treatment". Toxicology and Applied Pharmacology. 224 (3): 326–336. doi:10.1016/j.taap.2006.11.007. PMC 2094388. PMID 17174370. ^ Messina, M; Redmond, G (2006). "Effects of soy protein and soybean isoflavones on thyroid function in healthy adults and hypothyroid patients: A review of the relevant literature". Thyroid. 16 (3): 249–58. doi:10.1089/thy.2006.16.249. PMID 16571087. ^ "Risk assessment for peri- and postmenopausal women taking food supplements containing isolated isoflavones". EFSA Journal. 13 (10): 4246. 2015. doi:10.2903/j.efsa.2015.4246. ^ "Soy". US National Institutes of Health. May 5, 2011. Retrieved October 10, 2012. ^ Choi HK, Atkinson K, Karlson EW, Willett W, Curhan G (March 2004). "Purine-rich foods, dairy and protein intake, and the risk of gout in men". N. Engl. J. Med. 350 (11): 1093–103. doi:10.1056/NEJMoa035700. PMID 15014182. ^ Weaver AL (July 2008). "Epidemiology of gout". Cleve Clin J Med. 75 Suppl 5: S9–12. doi:10.3949/ccjm.75.Suppl_5.S9. PMID 18819329. ^ "SAFEX Commodity Derivatives Market". Johannesburg Stock Exchange. Retrieved February 19, 2012. ^ "交易所动态". Dalian Commodity Exchange. Retrieved February 19, 2012. ^ "Exchange Introduction". Dansai Commodities Exchange. Archived from the original on February 18, 2012. Retrieved February 19, 2012. ^ "Today's Market (Deferred)". Tokyo Grain Exchange. Archived from the original on February 20, 2012. Retrieved February 19, 2012. Wikimedia Commons has media related to Soybean. Wikisource has the text of the 1920 Encyclopedia Americana article Soy bean.